• 92 sq. 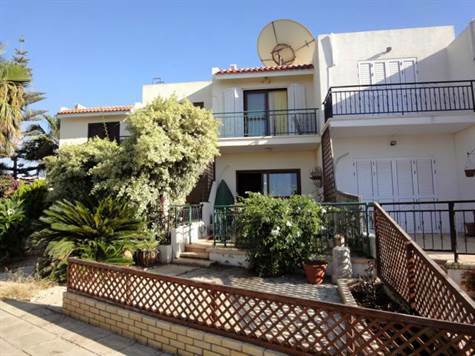 m., 2 bath, 2 bdrm 2 story - €75,000 EUR - Title Deeds & Sea Views! The ground floor features a spacious living room, with lounge, dining area and end kitchen. A full cupboard size area opposite the cloakroom, plus an understairs cupboard, provide useful storage space. The kitchen is nicely separated from the lounge and dining area by a breakfast bar, and patio doors open on to a covered terrace ideal for outdoor dining. Upstairs are two double size bedrooms - both with fitted wardrobes, and a bathroom with fitted shower. Further storage space is available with fitted cupboards on the landing. The master bedroom has patio doors providing easy access to a balcony with breathtaking panoramic sea and mountain views - an ideal place to sit and watch the beautiful sunsets. There are terraces both sides of the property. The one side has a pergola providing a shady seating area, and the other has a two tier terrace, one of which is covered. The property has full title deeds and is suitable for both holiday and residential use. There is an allocated parking space and there are no communal fees.